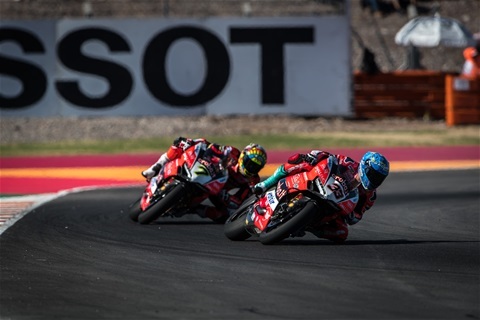 After taking second place in Race 1, the Aruba.it Racing - Ducati team stepped on the podium again with Marco Melandri in Race 2 at Villicum (Argentina), home of the twelfth round of the 2018 WorldSBK Championship. The Italian mounted a strong comeback from third row and, after a hard group fight early on that saw him drop down to ninth, he recovered ground and made several passes to finish third. Starting from fourth row, Chaz Davies got off to a strong start, climbing back up to third position, and eventually finished in fourth place, a result that helped him extend his lead in the fight for second position in the championship up to 24 points over Vd Mark. After 12 rounds, Davies (348 points) and Melandri (286 points) are respectively second and fifth in the championship. The Aruba.it Racing - Ducati team will resume action at Losail (Qatar) for the last round of the season, scheduled for October 23-25. "We rode a good race today as well but I'm a bit disappointed because I was coming back strong and when I was fourth I made a mistake at turn 6, going wide and coming back in ninth position. Then we made several passes to climb back again and, with five laps to go, I saw Forés and tried to push even harder to catch him, but he rode well and I couldn't close the gap. Third place was the best we could do today, and I'm looking forward to get better results in Qatar. The team and I have been working well, so I'm confident ahead of the last round." "It's been a topsy-turvy weekend for us, so, to get fourth today feels a bit like a salvage. We got good points, which is important in the fight for second place in the championship, extending our lead again. That said, we didn't have the most ideal weekend. A couple of technical issues made us start on the back foot and put ourselves in a position to take a bit too many risks. Today we got through the field and into a reasonable position early on, and then I kept my head down and tried to get on the podium. Towards the end, I felt like I had a little bit more left, but I didn't want to risk too much after what happened yesterday. We have a better potential than what we've shown here and I'm looking forward to make the most of it in Qatar." "Marco had a really strong weekend as he was competitive in each session, taking home two important podiums and pole position. Unfortunately, Chaz didn't have an easy round due to some problems but, after crashing out in Race 1, he made a strong comeback today together with Marco. To this end, I want to thank all the guys in the team because they worked really hard to allow us to achieve the best possible results."